It is in our faith that we can stand in the promises of God. And standing in the promises of God does not mean we already have it and therefore don’t have to wait. 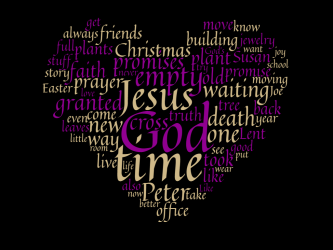 Lent is that time when we spiritually live into the waiting part of our faith. It is a time for us to remember that we must not take Easter for granted even though we know it will come, just because it always does come. This, my friends is a time to live into the reality that we need God on God’s terms. This is the time to remember that the promises of God are not ours to determine or own but merely to follow, to trust and to obey. During Advent I failed to tell you one of my Advent stories. This may be in part because it is a personal story that comes with some remorse and confession. Perhaps the confession nature of this story makes it a story better used as an illustration of Lenten themes though. It was Christmas time. I was 9 years old. Life could not have been any better. We had a particularly beautiful live Christmas tree that year and I had a new friend, Susan. Susan had moved in four doors down over the summer and we had been playing together and hanging out with Donna and Louise, the Bowdoin sisters who lived on the other end of the block. This was quite welcome in a neighborhood full of boys. Susan was a bit older and this made it even better. She was in middle school and I admired her maturity! She gave me a small wrapped box for Christmas quite early in the season. I showed it to my mother and placed it gingerly under our tree. It was one of the first presents under that tree. By Christmas four weeks later, there were more presents than tree! But I was having trouble waiting. This is, you know a tradition that resembles waiting on God. We tempt ourselves with secret giving and try to hide our love for each other through boxes and wrapping paper and we try live into the excitement of the joy of the birth of Jesus. Waiting on God is what Advent is all about. So, one day, when no one was around, I took the little box from Susan and I snuck behind the sofa and I carefully opened it. It was a beaded bracelet. A lovely little piece of jewelry that symbolized my friendship with Susan. It symbolized for my 9-year-old heart that I was worthy of friendship and of gift exchange. But it was ruined. I taped it back and put it under the tree and when Christmas morning finally came, I opened it and acted surprised. No one really noticed. No one ever knew. I had ruined Christmas a little bit by not waiting on God. So, Lent is a time for such confessions. With Easter we get the joy of Resurrection and the second chances that come with that. But we try to rush all that too. Lent is a time to live into our need for repentance, redemption and reconciliation. But we have trouble waiting on God. We have trouble trusting in the promises of God. All of this brings to mind another memory from my 9th year. Later, in the Spring we had a large Sunday School going and we would start our lessons by singing some hymns. “Standing on the Promises” was a favorite. My church friends, Beth and Karen and I were musical and we could sing the harmonies and we would sing this hymn at the top of our voices and then giggle. We were actually making fun of the old time music which we found silly. Karen’s mother would shoot us looks from the piano bench where she was banging out the accompaniment. We giggled and played and didn’t take our lessons seriously. I look back now at that time with shame. You see, our parents had worked hard, tithed, pooled their money in a capital campaign, and built a two story 10 room Sunday school addition to our church the year before that and every Sunday we were enjoying this brand new building full of children, two teachers in each room and Karen’s mother who went to each room for some music time. It was a beautiful building and an amazing opportunity for us to learn about God and the Bible and even old time hymns. We took that Sunday School building for granted. We took the church for granted. I think we even took our faith for granted. Now that building sits mostly empty. Some young mothers use it for mother’s-morning-out daycare during the week - something that is secular and pays enough rent to keep it maintained. But no one talks about God or the Bible in that building anymore. It used to be empty during the week and full on Sundays. Now it is empty on Sundays and empty of Christian education at all times. Today’s readings are about the promises of God. The Promise of God to Abraham, and to us through him, and the promise of Jesus when Jesus predicted his death to his disciples. Like Peter who misunderstood Jesus, who took the Messiah for granted, we read this Gospel lesson as a prediction of Jesus’ death and we tend to forget it is a prophecy -and promise- of also his resurrection and of his eternal presence with us in the Holy Spirit. Like Peter, we just see the death. It is sometimes hard to lift up our hearts and see the promise of God’s eternal presence with us. We get impatient and want to get to the good stuff before it is time and when we are in this futuristic place, we tend to move past the good stuff in the process of our impatience. Wearing the cross as jewelry has often offended me and others because it seems to trivialize the passion of our Lord. To wear a cross on a neckless or earrings has been compared by some to wearing a miniature golden or silver electric chair or guillotine! The cross was an instrument of torture and murder. So you might as well wear a symbol like it on a chain. Some say the crucifix, a cross with the image of our Lord’s body on it, should never be worn as jewelry. Some say the same is true of wearing an empty cross as jewelry. But in reflection on this Easter promise - of the empty cross - I am reminded that Jesus promises resurrection not continued death. That is why we celebrate empty crosses and render them in gold and silver and the stuff of our finest adoration. It is what is to come but is also what has always been and always will be - the ultimate love of God always with us. The cross that was left empty, the tomb that was left empty. To wear this on our bodies in some way is a personal piety, a symbol of our faith in the promise of the eternal presence of the Holy Spirit. My husband was in a nomadic time in his life when his work caused him to move often and use various offices. This was back when offices were really important to professionals. He had a large library and big desk top computer and a rocking chair and way too much stuff, but it seems every 9 months or so he had to move it all because he was moving up the corporate ladder in the then booming Health Care field. Each time he would leave an office he would receive gifts, tokens of appreciation from co-workers. Once, a particularly close co-worker with whom he also had a friendship, gave him a plant. He stuck the plant on the moving truck and took it into his new office. It was a Maranta arundinacea - Sorry! Just dropping some Latin on you to see if you were listening! We call it a prayer plant. These lovely plants from Central and South America are called prayer plants because they fold up their leaves at night. They do this instinctively when the darkness of evening comes. I think this is to protect their leaves when there is no need for sun soaking and also to catch water that is dropped from taller plants and trees during the night. The folding of these leaves creates a funnel for collecting precious water in this way but it looks like hands in prayer pose. Joe tended his new plant at first. He loved it as it reminded him of his friends he had left behind. But in his busyness at the new job he began to neglect it. He found it dry and folded one morning and gave it a good soaking and set it out on the deck outside of his office to get some sun. And then he forgot about it. He can’t remember how long it was - maybe six months before he found it, when he was about to move yet again. It was all dried up. Completely dead he was sure. But he figured he could reuse the pot and needed to clean up the now old office so he threw it on the moving truck again. All this moving was difficult and Joe was weary from it. He missed his old friends and his family and he found himself feeling lonely and blue that year during Lent. A few weeks later, it was Easter time. And Joe was still unpacking and settling into the new office. He found the prayer plant. Much to his surprise new leaves were sprouting from the old dead dried branches. Joe vowed to never again neglect this plant. To never again take it for granted. He nurtured it back to full strength and now we have three or four of these prayer plants, the younger ones were sprouted from the original, and they are all healthy and beautiful house plants. When Peter rebuked Jesus for predicting his death and resurrection, Peter only heard the death part. By rebuke we imagine some sort of disrespectful rant, like Peter saying essentially, “Shut up!” to Jesus. And, well, that is pretty much what happened. Peter wanted to ride the wave of joy and learning about this gospel of love and did not like hearing Jesus talk about death and endings and, so, Jesus essentially said, “Shut up!” back at him. But Jesus wasn’t calling Peter Satan in the way we might think. He wasn’t calling Peter names here. Like, “I know you are but what am I?” Or anything like that sort of childish banter. And so friends, we’re half way through this Lenten season. For the rest of it, I invite you to find more time to sit with God and ponder the meaning of waiting on God. I invite you to find more time for prayer. I invite you to pray for more understanding of God’s promises for your life, for the life of the parish and for the whole church. I invite you not to take any of these many blessings for granted. In that way we can put Satan behind us and move on in our following of God in Jesus Christ, our only savior and redeemer.